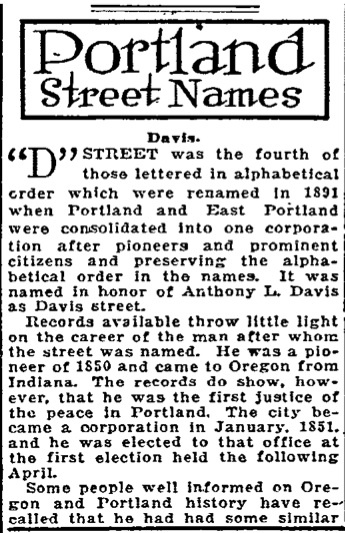 “D” Street was the fourth of those lettered in alphabetical order which were renamed in 1891 when Portland and East Portland were consolidated into one corporation after pioneers and prominent citizens and preserving the alphabetical order in the names. It was named in honor of Anthony L. Davis as Davis street. Records available throw little light on the career of the man after whom the street was named. He was a pioneer of 1850 and came to Oregon from Indiana. The records do show, however, that he was the first justice of the peace in Portland. The city became a corporation in January, 1851, and he was elected to that office at the first election held the following April. Some people well informed on Oregon and Portland history have recalled that he had had a similar office in Indiana. but the information is not positive. A son, T.A. Davis was boring in 1834, indicating that Anthony L. was at least of middle age when he came to Portland in 1850.